Old Car Memories > Muscle Cars > 1970 AMC Rebel Machine – Don’t Mess with the Machine! 1970 AMC Rebel Machine – Don’t Mess with the Machine! American Motors Corporation (AMC) was the small player in the car market during the heyday of the U.S. auto industry. Today the only remaining remnant of AMC which has been defunct for three decades, is Jeep. AMC may have had small a development budget compared to GM, Ford, and Chrysler back in the day, but it produced some good cars. AMC offered its share of true performance cars during the muscle car era. AMC came to the muscle car party late, but still made its mark. Its most legendary performance car was the 1970 Rebel Machine. The Machine was a true muscle car that could compete with such legends as the Pontiac GTO, Chevrolet Chevelle SS, and Dodge Charger R/T. The Machine was the natural evolution of the AMC muscle car that started with the 1968 AMC Javelin and 1968 AMC AMX. The former competed in the pony car segment while the latter competed in the 2-seat performance car market. To be fair AMC was the first to drop a performance oriented V8 engine in a medium-sized car when it released the 327 cubic inch V8 powered 1957 AMC Rambler Rebel. The only reason the Rambler Rebel is not attributed to being the first muscle car, was it was only available in 4-doors. The Rambler Rebel was finally offered in a 2-door configuration for the 1967 model year when a newer larger mid-size Rambler Rebel was released. When equipped with the optional 280 horsepower 4-barrel carburetor 343 cubic inch V8, the 2-door Rambler Rebel was a budget muscle car. Even though it had attractive looks, it still looked a little too conservative and was a little short on cubic inches to be a serious muscle car. 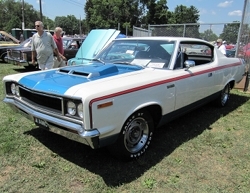 Fast forward to the 1970 model year, the AMC Rambler Rebel was now the AMC Rebel and in 2-door form it had a few slight exterior styling updates giving the car a more macho appearance. But it was the addition of Rebel Machine to the Rebel lineup that showed the world AMC was serious about competing in the muscle car market segment. AMC would refer to the Rebel Machine as “The Machine” which helped to convey the impression this wasn’t a muscle car to tangle with, but one serious machine (no pun intended). AMC had shocked muscle car fans when it partnered with Hurst to transform the stodgy compact Rambler which was considerably smaller in size than the Rebel, into a 390 cubic inch V8 powered 1969 SC/Rambler (or sometimes referred to as the Scrambler). With the SC/Rambler, AMC offered a couple of optional exterior paint and decal themes which were painted in patriotic red, white, and blue. The 1969 SC/Rambler was a low production one year only offering. Since the Rambler was replaced by the all-new Hornet for 1970, AMC and Hurst collaborated instead for 1970 on the Rebel Machine. Standard on The Machine where stylish Kelsey-Hayes produced 15×7 inch wheels with chrome center caps and performance oriented E60-15 Polyglas Goodyear tires. This was something many revered muscle cars in 1970 didn’t have including the 1970 Chevrolet Chevelle SS 454 LS6 which had mandatory 14×7 inch wheels and 14-inch tires. It didn’t just stop there, AMC slapped just about every performance goody on The Machine as standard that most muscle car buyers wanted. There was a massive functional hood scoop which rammed cold air into the high-performance engine. 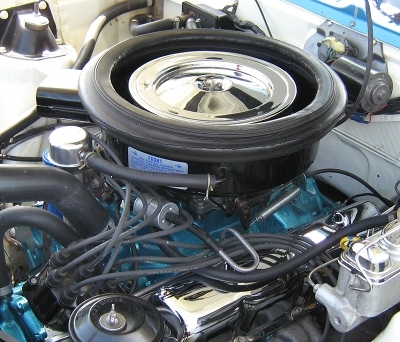 An electronic tachometer was integrated into the back portion of the hood scoop. There was a wild patriotic red, white, and blue paint scheme which was tamer than the previous year’s SC/Rambler, but still was very bold. Worth noting, AMC did offer during The Machine’s production run, different exterior colors with a mandatory black hood. The Machine was standard with a heavy-duty Borg Warner T10 4-speed manual transmission, this was impressive since most muscle cars of this time period had a 4-speed manual available at extra cost. A limited slip rear axle was standard and available in a 3.54:1 or 3.91:1 rear axle ratio. A 3-speed automatic was optional and came mandatory with a 3.15 rear axle ratio. The heart of The Machine was AMC’s hottest performance engine, the 340 horsepower and 430 lb-ft of torque 390 cubic inch V8. It had a 10.0:1 compression ratio, a 690 CFM Motorcraft Autolite 4300 4-barrel carburetor, and other performance goodies. A free-flow dual exhaust system was standard. All this equated to a 14.4 second quarter mile time which was mighty impressive. However AMC didn’t stop there it offered a “service kit” package for only $500 from its network of dealership parts departments. The “service kit” was purchased mostly by those who wanted to race their Machines. This package increased horsepower by at least 100 ponies and allowed The Machine to obtain high-12 second quarter mile times. It’s a pity that AMC didn’t offer the “service kit” package from the factory. If it had, the Machine would have had the honor of being the fastest production muscle car during the original muscle car period. AMC also offered ridiculously low 5.0:1 rear gears though its dealership parts network. AMC definitely knew it’s audience when it offered The Machine for a base price of only $3,475. It was so much performance for the money. 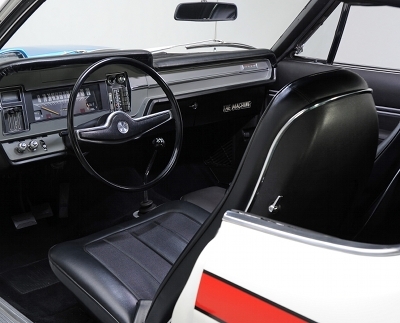 AMC didn’t bother with trying to make the Rebel’s interior more upscale for The Machine, it kept it as Spartan as a fleet taxi cab or police car. Only the bare essentials were found inside The Machine’s cabin. This also kept The Machine’s curb weight down to a little over 3,600 lbs. The Machine was aimed at buyers who wanted serious performance and lots of exterior flash. The sad aspect of The Machine was it was great muscle car that came to the party too late. Muscle car sales by 1970 were tanking heavily due to high insurance premiums. This was one of the factors why only 2,326 Machines were produced for 1970. Had The Machine arrived on the scene in the mid-1960s, AMC could have been the all-star player during the muscle car time period. AMC for 1971 brought back The Machine as a “Go Machine” package for the 1971 Matador. It’s production volume was similar to the 1970 Machine. By the mid-1970s AMC was out of the performance car business entirely. Though AMC may be long gone, The Machine still lives on as a muscle car legend. « Jeep to Produce New Grand Wagoneer?